← Day 2.. We have arrived in Basse! Day three of seventeen complete! Not only did I run the full 25km today, but I was accompanied by three amazing people for the entire day – Congratulations to Kebba for completing the entire 25km after running over 20km the past two days, to Pa for running the entire distance on new shoes (blisters), and chaffing, and to Harouna (Aaroun), the local NSGA coordinator, for completing the entire distance for his first day as a runner. Pretty inspiring stuff, and so neat to work together to get each of us through the challenging parts so we could all finish together. Congratulations Team! Before I get into the run, I would like to talk a bit about what we did last night after the run (besides the usual eat, drink, and sleep as much as possible). Last night, we were able to do a radio talk show with a local radio station about love4gambia, the NSGA , and what the run is all about. Most of the interview was composed in the local Gambian language, but from what I understood it went well, and the DJ (Alhagie Jalbul, a teacher coordinator at a local Basse School) graciously thanked me for my ‘sacrifice’. In return, I was able to thank all Gambians in the region for their support and encouraged them to run with us as we head out from Basse the following day. 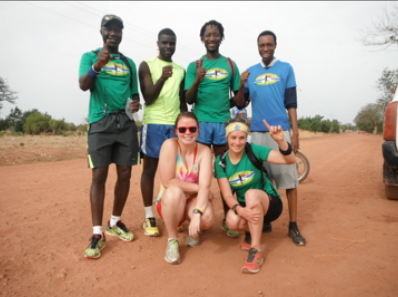 Hopefully this helps to increase the profile of Love4gambia and more people will know why we are running when we pass them by in the middle of nowhere. Start to day three! 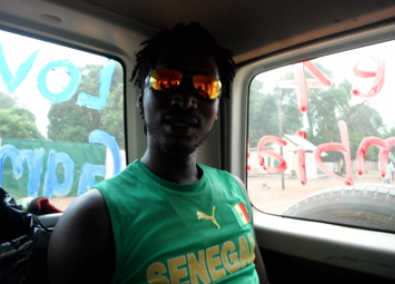 Banjul Calling! Today, we started out later than usual because we were starting on the outskirts of Basse (first major town we had to run through). 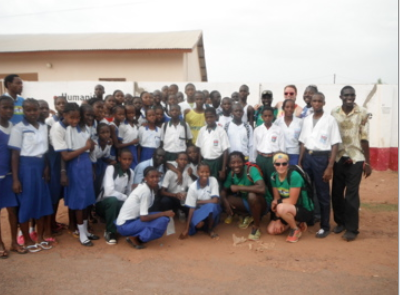 We wanted to start after the students at the local schools had a chance to go to attendance so that they would be able to run with us. And, wow, we passed four schools while running through town, and each time a huge group of students was lining the road, cheering as we approached. We would high-five them all and the group would join in behind us in support of our run. 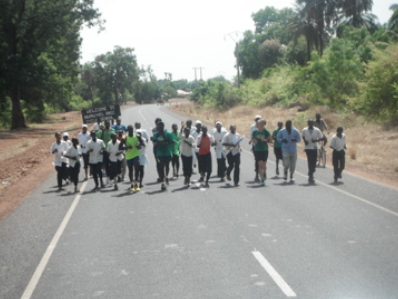 We must have had about 200 students running through the narrow streets of Basse in support of love4gambia and peer health education. WOW! 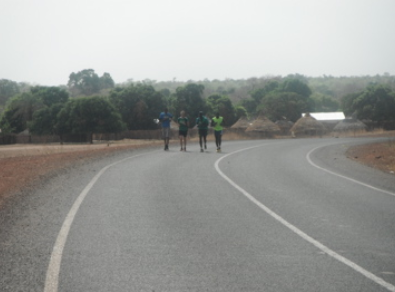 After leaving Basse, it quieted down quite a lot, we all got into our own rhythm and continued on, running a couple of kilometers, then rehydrating and refueling often. Because we started later today, the sun is blaring hot. We also made the transfer from dirt road to black asphalt after leaving Basse, and there is a noticeable difference. But, we cheer eachother on and keep going. 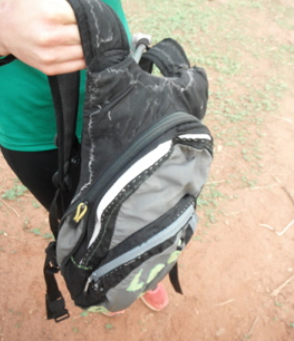 Proof of how sweaty and hot it is here – salt residue on the camelback after 2 days – bring on the gatorade! And off we went again. Soon enough, we had made it to kilometer 20 and it was time to rest for a while. We read and share messages from Erin, Cathy, and “Aunt Debbie”, which inspire us to finish the rest of our run – it really means a lot to us to have support from both side of the Atlantic. And so, another day is over and we are 25km closer to reaching our goal. Tomorrow we will make it to 100km and then we will be able to rest the following day – something we are all looking forward to. I can’t wait to share with you how tomorrow goes! P.S: Still no wi-fi – GPS files to be posted soon! Also, a special shout-out to Spider (now called “bug”) and Mama Cie for their help in getting us through the run today – we couldn’t have done it without their support! “Mama Cie” is taking good care of me! COuldn’t do it without her! 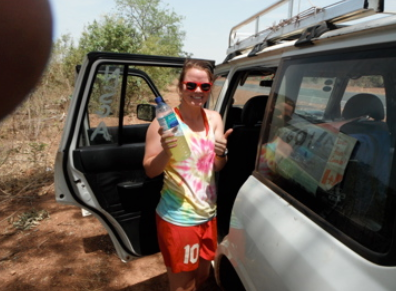 This entry was posted in Running in Africa and tagged Basse, camelback, Gambia, Nova Scotia-Gambia Association, radio interview, salt stains. Bookmark the permalink. Another amazing day for you and the whole team! Congratulations for doing so well running in high heat most of the time. I hope you have a relaxing and long rest tonight to recharge your batteries. All the best for tomorrow’s run and your next adventure. Look forward to reading…. will be thinking of you as you run beyond 100km!!!! What an amazing team! Love following your progress, so many are cheering you on on this side of the Atlantic! Go team go! It is incredibly eye-opening to see how many schools are being supported through NSGA, what a program and what a team you have behind you Jen! So many people behind you, and so many fist pumps. Hi Jen! I’ve been following you and am so inspired by your journey so far. I’m sure you are needing to dig pretty deep sometimes to get through the miles and that it’s hard to keep that positive focus. Stay tough and think about all the supporters and believers you have. At the end of the day, you should feel so proud of what you and the team are doing! Way to go! !